12' USAWELD replacement welding gun for Matco MIG welders. Equivalent to Matco part numbers 238-155-000 and 4320. 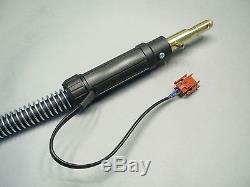 This is a direct replacement welding gun with no modifications required. It uses the same tips, gas nozzles, and diffusers as the original gun. Take a close look at the end of the welding gun and notice how the gun connects to the welder and also how the trigger wires connect to the machine - if your machine looks like this, then this gun will fit. This gun fits the following Matco MIG Welders. WFFC Tote MIG Model 117-055. WFWT Tote MIG Model 117-027. It will feed all types of wire, including mild steel, flux-cored, and stainless steel. The gun comes standard with a. But we believe this HTP replacement gun is better than the OEM gun. As it is a heavier duty gun. Picture 1 gives you a good overview of the gun. You can see the heavy duty spring in both the handle and where the gun plugs into the machine, which offers a much better support system than the OEM gun. Picture 2 shows a close up of the handle. Our handle has a clean ergonomic design so it fits in your hand better than the OEM gun. The spring support prevents the cable from kinking where it leaves the gun. Picture 3 gives you a close up of the end of the welding gun where it plugs into the welder. Again we use a spring support to prevent the cable from kinking. 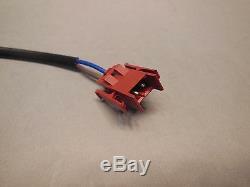 Picture 4 is a close up of the rectangular trigger connector. Picture 5 (photo 1) shows you the high quality of this gun. 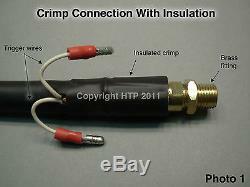 The crimp is insulated to protect the trigger wires from chafing. 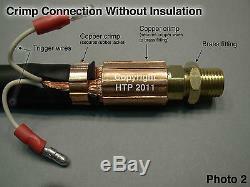 Picture 6 (photo 2) shows the actual crimp with the insulation removed. You can see the crimp that retains the rubber outer jacket and the copper crimp that secures the copper wires to the brass fitting that carries the welding current. 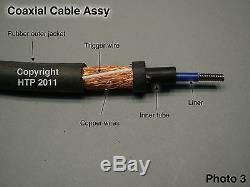 Picture 7 (photo 3) shows a cutaway of the coaxial cable assembly, where you can see the copper wires that carry the welding current, the trigger wires, and the inner tube that the wires are wrapped around. The liner runs through the inner tube, and the shielding gas runs between the liner and the inner tube walls. We use the same high quality construction on this welding gun that we use on all of the welding guns which are OEM on HTP MIG welders. The welding gun is complete - no tricks here - it includes the liner, gas nozzle. 030 tip, and the rectangular trigger connection. We have this gun available in a flex neck version as well. Go to our store and see all the items we have for sale. Please send us a message if you have any questions on our items. 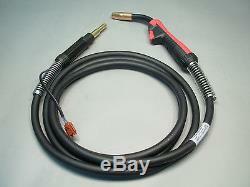 The item "12' Mig Welding Gun Torch Stinger Matco Tools Welder Weld Parts" is in sale since Thursday, May 23, 2013. This item is in the category "Business & Industrial\CNC, Metalworking & Manufacturing\Welding & Soldering Equipment\Welding\Welders, Cutters & Torches\MIG Guns & Torches". The seller is "usaweld" and is located in Elk Grove Village, Illinois. This item can be shipped to United States, Canada, United Kingdom, China, Mexico, Germany, Japan, France, Australia, Denmark, Romania, Slovakia, Bulgaria, Czech republic, Finland, Hungary, Latvia, Lithuania, Malta, Estonia, Greece, Portugal, Cyprus, Slovenia, Sweden, South Korea, Indonesia, Taiwan, South africa, Thailand, Belgium, Hong Kong, Ireland, Netherlands, Poland, Spain, Italy, Austria, Bahamas, Israel, New Zealand, Philippines, Singapore, Switzerland, Norway, Saudi arabia, Ukraine, United arab emirates, Qatar, Kuwait, Bahrain, Croatia, Malaysia, Chile, Colombia, Costa rica, Dominican republic, Panama, Trinidad and tobago, Guatemala, El salvador, Honduras, Jamaica, Viet nam.